Ariana Coins | Central Asian | Sasanian | ACSAS-148, Sasanian Kings, Kavad I 499-531 AD. AR Drachm. Very rare mint. 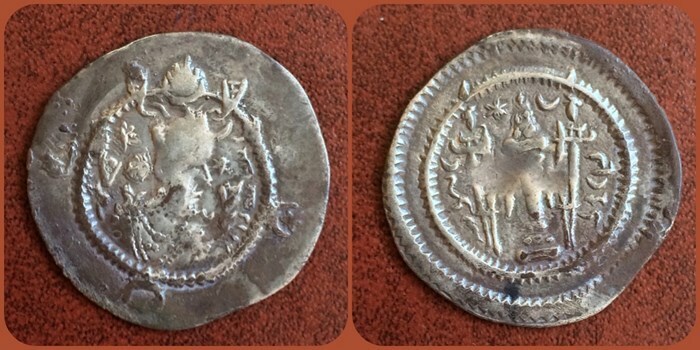 Home > Central Asian > Sasanian > ACSAS-148, Sasanian Kings, Kavad I 499-531 AD. AR Drachm. Very rare mint. ACSAS-148, Sasanian Kings, Kavad I 499-531 AD. AR Drachm. Very rare mint. Sasanian Kings, Kavad I 499-531 AD. AR Drachm. 28.57mm, 3.92gm. GNCKR (Ganjak) mint, year 34. Bust right, wearing mural crown with frontal crescent, two ribbons, and korymbos set on crescent, ribbons and crescents on shoulders; stars flanking head, star-in-crescents in margin / Fire altar with ribbons; flanked by two attendants; star and crescent flanking flames. SNS type Ic/1a; Gobl type III/1; Saeedi -; Sunrise 967. Good very fine. Very rare mint. The identity of GNCKR has tentatively been translated as the city of Ganjak in southern Azerbaijan, the portion of Azerbaijan now located within Iran. It was a major city near Lake Urmiya, destroyed by the Byzantines in 622 AD, during the intense fighting between the Byzantine and Sasanian empires. The alternative assignment of this mint to Ganja, in the northern section of the independent county of Azerbaijan, is no longer accepted.